King Air Mods | New life for old airframes. - Africair, Inc.
Making a good aviation product better is a concept as old as capitalistic ingenuity itself. OEMs release improved versions of their best airplanes and power plants, each perhaps a bit faster or more versatile than its predecessor. Not everyone can afford the latest edition of a machine, of course, nor does everyone want one. Some operators get as comfy with an airplane they’ve spent years breaking in as they might be with a favorite jacket or pair of running shoes. But most wish their airplane could deliver better performance. That’s where modification companies stand ready to make that good airplane even better. Consider recent production figures from Textron’s Beechcraft unit showing nearly 7,500 copies of the rugged King Air turboprop delivered since its introduction more than 50 years ago. Any mod house would consider a universe that large enough reason to begin engineering efforts, but sometimes real success demands more. Dave Coleman credits part of the King Air’s triumph as a mod platform to the original link between Beechcraft and the U.S. military. Coleman works in aircraft sales and acquisitions at Duncan Aviation and has been around King Airs for decades. He points to the King Air’s predecessor, the Queen Air, as the place where the market really developed. “The military wanted the Queen Air to be modifiable right from the start,” he says. The Queen Air offered an enormous cabin for its day, but it wasn’t pressurized, a fact made more problematic once people began hanging Pratt & Whitney Canada PT6 turboprops on them. Thus was born the first pressurized King Air 90, in 1964. A King Air C90GTx in the process of receiving a new four-blade swept propeller. King Air upgrade options today run from new engines and propellers to airframe enhancements to a host of advanced cockpit avionics. Toss in some new paint and an interior update and the result is an older airframe capable of delivering performance that closes in on that of a new airplane, all for a less costly investment. Edwin Black, Blackhawk Modifications’ senior vice president of sales and marketing, says King Air 300 owners he meets often struggle with whether to “keep the airplane’s comfortable cabin and good short-field performance or trade up to a jet.” One answer is Blackhawk’s recently approved XP67A engine STC for the King Air 350. Work began on the mod in July 2016. Among its benefits, the Blackhawk re-engined King Air will race to FL 350 in just 18 minutes versus the 45 minutes it takes a stock aircraft. At that altitude, the 13,000-pound Blackhawk King Air will scoot along fully 50 knots faster than a new factory airplane. Blending these airframe numbers — 2,980 Model 90s, 400 Model 100s, 2,580 Model 200/250s and 1,400 Model 300/350s — with a structure just begging for improvement was the honey that attracted bees like Jim Raisbeck, one of the industry’s first modification giants. 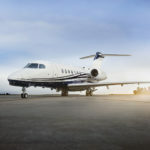 Raisbeck earned his modification stripes rethinking Learjets and North American Sabre­liner 65s, as well as building hush kits for the Boeing 727. Raisbeck and his team delivered their first King Air 200 mod, a set of enclosed landing gear doors, in July 1982. The rest is Raisbeck history, with King Air updates such as wing lockers and today’s Epic platinum performance mod, which offers near magical improvements to a King Air 250, for example. Ice Shedder by Raisbeck improves airflow without compromising FOD protection. Raisbeck can add a pair of swept-blade props, a ram air recovery system, enhanced-performance leading edges, or high flotation gear doors on the King Air 250 and other models, as well as increase the airplane’s operating weights. Raisbeck claims its modifications can be found on more than 4,000 King Airs today. Some of Raisbeck’s improvements proved so unique that Beech began offering them as standard equipment on new airplanes. Coleman suggested comparing a 40-year-old King Air 200 with an Epic gold package to a much newer 200GT. “The Epic King Air will perform better on paper than the 200GT,” he says. Then there are engine mods like Blackhawk Modifications’ for the Pratt & Whitney Canada PT6A-42 engines that were standard on the King Air B200 series. Sign up for the XP61 upgrade and Blackhawk will replace the original engines with a pair of PT6A-52s for impressive benefits. 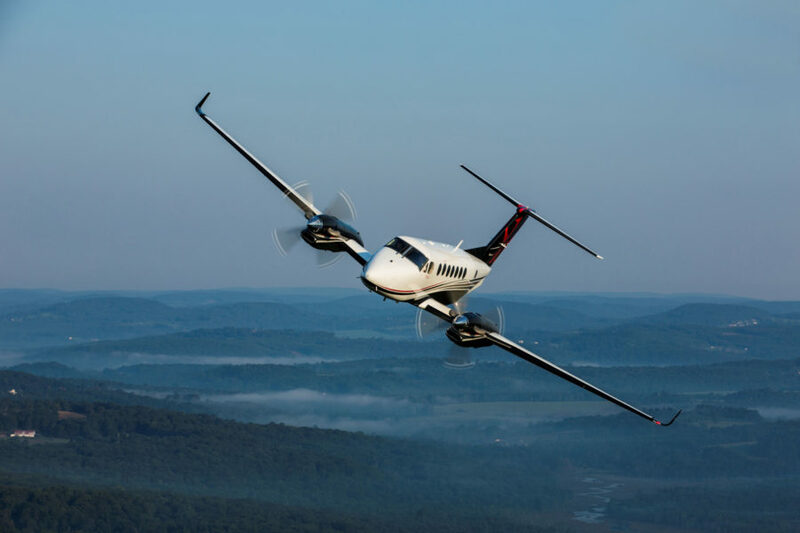 Maximum cruise speed on a stock B200 is about 266 ktas, but pilots flying a Blackhawk XP52-upgraded B200 will see speeds closer to 310 ktas, more than a 15 percent increase. 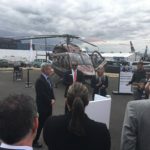 The secret is that Blackhawk installs engines with a thermodynamic shaft horsepower of 1,320 versus the 850 on the standard airplane, so the performance benefits do come at the price of a higher fuel burn. The larger power plants arrive with full new-engine warranties from Pratt & Whitney Canada while delivering increased rate of climb, a reduction in time to climb and reduced fuel burn for the climb. A Blackhawk-upgraded engine also delivers better single­-engine climb performance, along with an increase in resale value. New engines may call for new propellers too, but not always. The Raisbeck or MT propellers are an option if needed. Of course, some King Air modifications don’t necessarily deliver quantitative performance updates but are popular nonetheless, such as Frakes Aviation exhaust stacks. Straight from the factory, King Airs were known, like other jet-A burning airplanes, to create ugly black soot stains on the engine nacelles that often demanded regular and exhausting work to remove. Thanks to Frakes’ engineering work, installing new stacks can reduce soot staining by 90 to 95 percent. Frakes says the stacks are flying on more than 1,000 King Airs of various models. Should a Frakes stack crack in the first seven years of ownership, the factory guarantees a no-charge replacement. BLR Aerospace says its winglets on a King Air 200 mean reduced times to climb, extended range, improved handling, as much as a 33 percent reduction in required runway length and up to a 50 percent increase in climb gradient at sea level. BLR says the winglets increase the aircraft’s hull value too. Winglets add to the cosmetic value by making a legacy King Air look more 21st century just sitting on the ground. Garmin’s G1000 NXi adds serious avionics computing power and features to the original G1000’s capabilities. Garmin’s no stranger to the King Air cockpit. The recently announced NXi avionics upgrade is a faster, more modern successor to the G1000 that debuted in 2004. The NXi requires a minimal amount of downtime because the displays preserve the same footprint and connectors as the G1000. Once it’s installed, pilots will see faster boot-up times and much-improved graphics thanks to the better processors and higher-resolution displays. The NXi upgrade is also expected to shave 250 pounds of weight off most King Airs. The Pro Line Fusion option from Rockwell Collins offers touch-screen displays, dual FMS and ADS-B. Rockwell Collins’ Pro Line Fusion upgrade is a good choice for any King Air already operating with Pro Line II or Pro Line 21 avionics. Pro Line Fusion adds three 14.1-inch wide­screen LCDs with advanced graphics, touch-interactive maps, configurable windows, and touch-screen or point-and-click navigation. The upgrade includes geo-referenced electronic navigation charts that display own-ship aircraft position for enhanced situational awareness during approaches. Fusion baseline equipment works well in today’s global airspace by including a DO-260B-compliant ADS-B, SBAS-capable GNSS, LPV approaches and radius-to-fix (RF) legs. Additionally, Pro Line Fusion offers high-resolution synthetic vision standard, including Rockwell Collins’ airport dome depiction and extended runway centerlines with mile markers. BendixKing’s AeroVue brings some of the technology from Honeywell’s Primus Epic suite. King Air 350 owners heard some good news at this year’s AirVenture Oshkosh, with several companies announcing performance-enhancing mods for the largest version of Beechcraft’s twin turboprop. Hartzell Propeller and Raisbeck Engineering partnered to create an STC for a 105-inch-diameter composite five-blade swept propeller that improves takeoff and climb performance while reducing the airplane’s noise footprint. The composite prop has an unlimited blade life and a TBO of 4,000 hours or six years. Commuter Air Technology created a package for the King Air 300 airframe called the CAT 350ME that increases operational gross weight and fuel capacity. The 350ME can add up to 280 additional gallons of fuel, an option that could keep the aircraft airborne for as many as 13 hours, translating into a range of 2,760 nm. The upgrade package increases maximum ramp weight to 16,600 pounds, maximum takeoff weight to 16,500 pounds and maximum landing weight to 15,675 pounds. AvFab offers King Air operators a host of interior updates, from new seats and divan options to tray tables and pleated window shades. Butterfield Industries created a number of useful add-ons, such as an oil/air separator and an oil residue collection system to fit almost every King Air, as well as a fuel-point pan designed to better handle the daily metal-to-metal contact encountered during fueling operations of a King Air. And Coleman offers practical advice when considering any mod option. “How much is too much to spend? For most mods that claim to improve aircraft performance, it’s wise to determine if the STC holder has documented the improvement in the performance section of the FAA-approved aircraft flight manual supplement,” he suggests. Coleman mentions financial strategies to consider, such as the amount of money invested versus how the mod might affect the eventual selling price. “Why not look for an airplane that already has the mods you’re after, or find a really clean airplane with nearly run-out engines? If you found one with the Raisbeck mods you liked, you could purchase the Blackhawk upgrade that delivers precise documentation on the performance upgrades.” Those numbers in the AFM can really add to the value of a King Air used in Part 135 charter service. There’s also credit coming from Pratt & Whitney for the unused time on the old engines.